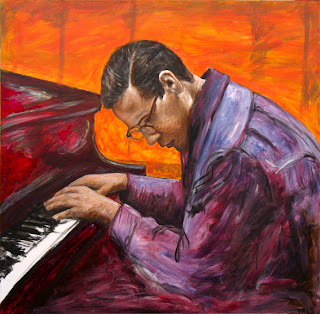 It's now official, I am honored to announce my painting "Submerged (Bill Evans)" was chosen by jazz89 KUVO Public Radio Denver as the stations design throughout 2009! Which means the image will be used as the station's logo on everything representing it, including station T-Shirts, Letterhead, business cards, website, newsletter, wine bottles, advertising ads, and all produced KUVO related marketing materials throughout 2009! KUVO is a 22 year old public radio station which is affiliated with NPR, has won many awards, among them the 2005 and 2006 Major Market Jazz Station of the Year! It is supported by donations, and the image of the painting will be distributed as part of the 'Thank You" gift the station gives to donors, either in the form of t-shirts, wine bottles or any other publication! Although I live nowhere near the Denver, Colorado area, I've been enjoying listening to the station via the live web streaming on the station's website, I highly recommend listening to it if you like and enjoy Jazz and blues! Thank you, KUVO, for choosing my painting and for bringing this excellent music to the airwaves! Thank you, Mary Ann, and great to see you here! yeah, it's so exciting, isn't it? Hopefully we'll get a chance to talk soon and I'll tell you all about it. Bill Evans ranks amongst my most fav musicians and I love the piano too. Oh, I am so loving your blog especially your work. Please bring me back here? Hey Tatiana and J.T., glad you visited and liked! Thank you! took me a little hile to comment but better late than never. Congrats Iris, hope this deal turned out very positive for you. Thank you Bertrand! yes, better late! I am also late... should frequent my own blog more often! I will visit yours now too! And thank you 'untitled', no I'm not on facebook yet, but plan on getting my facebook working soon! Thanks, Art. Bill Evans was amazing. Jazz music is wondeful, is a comfortable rhythm. Every time that i am listen this kind of music i usually fell relax. Actually i am reading about it frequently becouse i love it. In my search i found a site called costa rica investment opportunities it seem interesting, so i invite you to go there. To all the others who commented, my apologies for not responding before, for some reason Blogger doesn't inform me every time and I just now read your wonderful comments. thank you! !